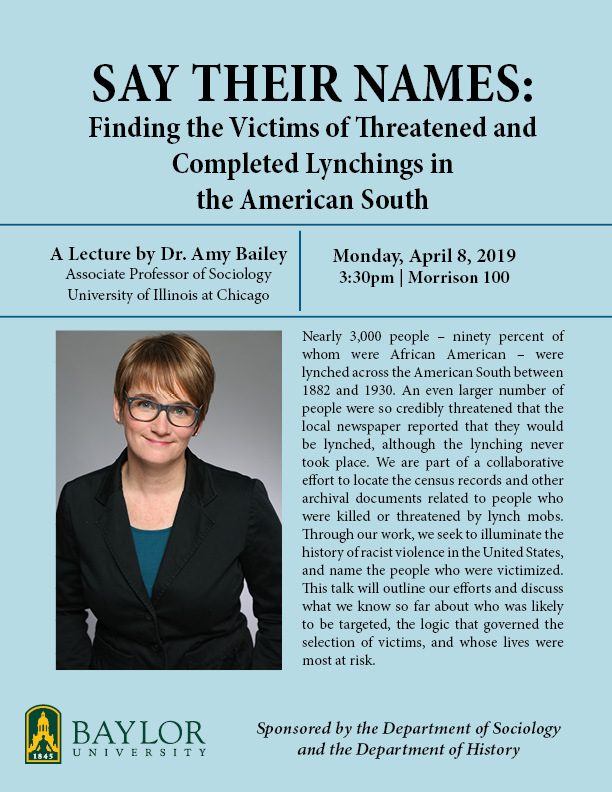 "Say Their Names: Finding the Victims of Threatened and Completed Lynchings in the American South," a lecture by Dr. Amy Kate Bailey, Associate Professor of Sociology at the University of Illinois at Chicago, on Monday, April 8, 2019 from 3:30-4:30pm in Morrison 100. Nearly 3,000 people — ninety percent of whom were African American — were lynched across the American South between 1882 and 1930. An even larger number of people were so credibly threatened that the local newspaper reported that they would be lynched, although the lynching never took place. We are part of a collaborative effort to locate the census records and other archival documents related to people who were killed or threatened by lynch mobs. Through our work, we seek to illuminate the history of racist violence in the United States, and name the people who were victimized. This talk will outline our efforts and discuss what we know so far about who was likely to be targeted, the logic that governed the selection of victims, and whose lives were most at risk.